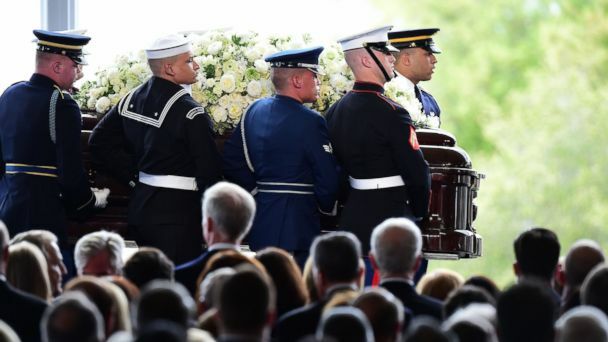 Former first Lady Nancy Reagan was laid to rest today beside her beloved husband "Ronnie" during a funeral service where friends and family recalled her the deep love that she and the former president shared. The front row was filled with famed politicians, including four of the five living first ladies -- Michelle Obama, Laura Bush, Hillary Clinton, and Rosalynn Carter -- and former President George W. Bush. Caroline Kennedy, the former first daughter and current U.S. Ambassador to Japan, was seated in the same row. James Baker, Ronald Reagan's former chief of staff, shared some memories about the couple's longstanding love. "He wrote her every single night. When they were together, he hid her love notes around the house to find," he said. "She saved his love notes in a shopping bag in his closet." Baker said that she was regularly involved with her husband's political moves, and was fiercely protective, especially after Reagan was shot. "The only day I saw her lose her composure was the day the president was shot," Baker said, telling how Reagan tried to reassure her by making a joke and saying "'Honey, I forgot to duck he said,'" Baker recalled. "That was his way of comforting her." Nancy Reagan was laid to rest at the Ronald Reagan Presidential Library in Simi Valley, California. Both of Reagan's children, Patti Davis and Ronald Prescott Reagan, both shared memories of their mother. "It's no secret that my mother and I had a challenging and at times contentious relationship," Davis said. "I tried her patience and she intimidated me," she said. Davis went on to share the memories of her mother that she chooses to remember, including times that she comforted her and times that they were together near the beach. The among the highlighted guests were ABC News' Diane Sawyer who gave a Gospel reading, and reporter Tom Brokaw, who had known the couple since Ronald Reagan ran for governor of California. Former President Bush was the only president in attendance, with President Obama scheduled to be in Texas for his speech to the South by Southwest conference. Californians like Rep. Nancy Pelosi, former Gov. Arnold Schwarzenegger and current Gov. Jerry Brown are on the guest list. Some of the famous non-political guests were expected to include Mr. T, Wayne Newton, Anjelica Houston, John Stamos, Tom Selleck, Bo Derek and Melissa Rivers. The Santa Susana High School Choir started by singing "Battle Hymn of the Republic" at the beginning of the service, and will perform "Amazing Grace" at the end before a recessional of bagpipers and a rendition of "God Bless America."